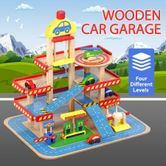 Keep your kids entertained with the Wooden Car Garage Toy Car Park Car Ramp Car Parking Garage Playset and help them learn things about real car garage. 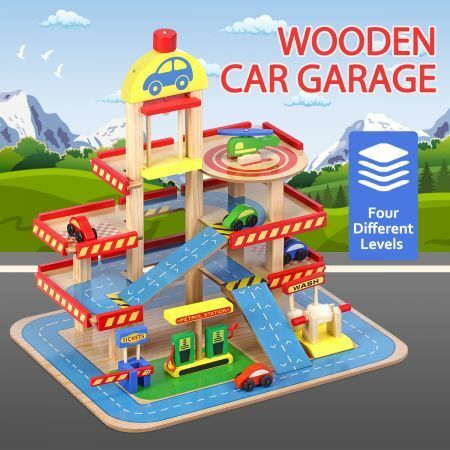 Buy this brightly colored wooden toy garage for your children which is helpful for acquiring manual dexterity, color perception, shape recognition as well as hand-eye coordination. The car parking has 4 parking levels. The first floor is for service center such as tickets, petrol station and car wash. The second and third floors are for cars and the top one has a helipad. The equipped working lift hauls cars up to the parking spaces. This toy car garage includes 1 helicopter as well as 4 cars colored in red, orange, green and blue, which are designed for little hands to grip easily. Spend your parent-child time and interact with your little boy or girl with this pretend play wooden parking garage!